The unemployment rate is a meisur o the prevalence o unemployment an it is calculatit as a percentage bi dividin the nummer o unemployed individuals bi aw individuals currently in the labour force. 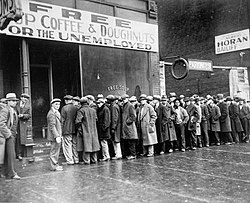 During periods o recession, an economy uisually experiences a relatively heich unemployment rate. Accordin tae Internaitional Labour Organisation report, mair nor 200 million fowk globally or 6% o the warld's wirkforce war withoot a job in 2012. This page wis last eeditit on 17 Februar 2017, at 04:16.